The Complete Trading System for Excel includes a suite of Excel add-ins for advanced analytics and trading of market data from Excel. Analyzer XL - Library of 146 technical analysis functions, indicators and experts in the form of Excel formulas. An indicator is used to determine the trend of a market, the strength of the market and the direction of the market. An expert is a predefined stock market system. RT Quotes XL - downloads real-time stock, index, futures, options and mutual fund quotes directly into Microsoft Excel spreadsheets. Free 15-minute delayed and fee-based real-time quotes for stocks, options, indexes, and mutual funds are retrieved from Yahoo! Finance. Data is available from more than 50 worldwide markets, including the US, Canada, UK, Germany, France, Italy, Australia, and India. Fee-based real-time quotes are available from PCQuote for stocks, options, indexes, and futures. Predictor XL - Neural network forecasting tool that quickly and accurately solves forecasting and estimation problems. It is designed from the ground-up to aid experts in solving real-world forecasting problems. The Excel tool brings increased precision and accuracy to a wide variety of tasks, including stock price and market prediction. Backtesting XL - An add-in for back testing trading strategies in Microsoft Excel. It enables the testing and evaluation end-of-day trading strategies using historical data. Functions can be optionally used in Excel VBA. The back testing add-in supports advanced functionality, such as pyramiding (change of position size during an open trade), short/long position limiting, commission calculation, equity tracking, out-of-money controlling, and buy/sell price customizing (trade at Today's or Tomorrow's Open, Close, High or Low prices). Classifier XL - An add-in for Excel designed to aid experts in real-world data mining and pattern recognition tasks. It hides the underlying complexity of neural network processes while providing graphs and statistics for the user easily to understand results. Ability to handle numerous, often-interrelated variables makes it widely applicable to classifying market data. For example, a trader may wish to classify stocks as buy, hold, or sell based on historical data. Portfolio XL - a portfolio tracking add-in for Microsoft Excel. It allows you to create a portfolio of stocks which can be updated intra day. You specify certain tickers, the purchase price and date, and Portfolio XL monitors the price value of your portfolio and your transaction history. It also displays the current value of your stocks. 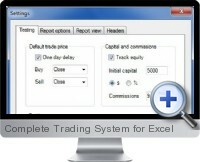 Complete Trading System for Excel version upgrades are free for life.